While the official song for the upcoming football World Cup 2014 in Brazil is ’We Are One’ and will be performed by Pitbull, Jennifer Lopez and Brazilian singer Claudia Leitte, England will have its own anthem to mark and spur the squad on during their World Cup campaign. Take That’s Gary Barlow teamed up with Gary Lineker as well as other past England stars including Sir Geoff Hurst, Michael Owen, Dion Dublin, Martin Keown, David Seaman, Kenny Samson and Peter Shilton, Gary Pallister, Dion Dublin, Carlton Palmer, Gary Mabutt and former manager Glenn Hoddle for the recording. The pop stars contributing to the World Cup track are former Spice Girls Mel C and Emma Bunton , former Girls Aloud member Kimberley Walsh, Pixie Lott, Katy B, Conor Maynard and Eliza Doolittle. 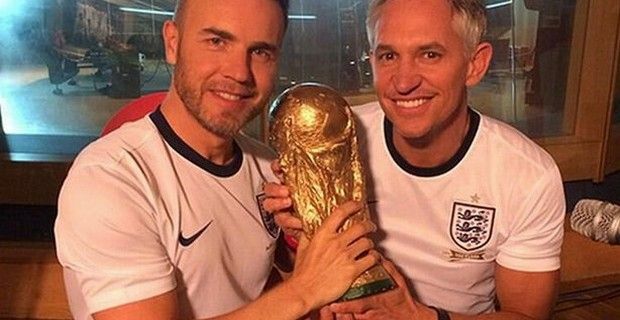 Lineker wrote on Twitter: ''I'm getting together one hell of a group for England's official FIFA World Cup song for @sportrelief . Teaching @GaryBarlow a thing or 2. (sic)'' and ''The boy @GaryBarlow done good for @sportrelief (sic)''. The video will be shown for the first time during Sport Relief night on BBC One on Friday, March 21 and proceeds from the sale of the record will also go to Sport Relief. In the 2010 World Cup tournament, England did not have an official anthem because former manager Fabio Capello didn’t want one, saying he wanted to be "fully focused on the football, but James Corden and Dizzee Rascal did release an unofficial anthem called “Shout” that debuted at number 1 on the UK Singles Chart.